Chrichton's World: Review Crouching Tiger Hidden Dragon: Sword of Destiny (2016): Curious sequel that is incredibly flawed but not that bad! Review Crouching Tiger Hidden Dragon: Sword of Destiny (2016): Curious sequel that is incredibly flawed but not that bad! Before I get into this sequel let me in short tell you what I thought of the original. I have been a fan of Hong Kong Cinema as long as I can remember. I must have been like three or four years old when I saw my first kung fu film. It was love at first sight. While my love deepened the rest of the Western world could care less about the genre until this co production came along. Honestly it still is a mystery to me (cinematically speaking) why all of a sudden a Wuxia film like Crouching Tiger Hidden Dragon made such an impact. I am not going to deny that it was good. It sure was. But it wasn't that extraordinary. As it did nothing I already had seen before in the dozens of Wuxia films before. Actually I found the martial arts to be a little underwhelming compared to what I normally was accustomed to. Now it has dawned on me that it could have been the marketing that made the difference. Previously there was this notion that the majority of the Western audience would not be interested in watching these flicks. Someone decided that this time they would be willing to watch and started to promote the film like they did with their usual Hollywood productions. But maybe it was also the simple fact that this film got released into mainstream cinemas. Most Asian films (sadly this has remain unchanged) are rarely shown in Western theaters. If they do it's in special festivals or arthouses. You have to wait until it is released on DVD, Blu-ray or online to enjoy them. It's almost criminal how these films get overlooked time and time again. Anyway we all know how popular the film is by now and undoubtedly is one of the main reasons this sequel came into effect. It is safe to say that even the hugest fans of the original weren't really waiting for a sequel. As far as I can remember it had concluded quite nicely and did not have lingering questions that needed answering. 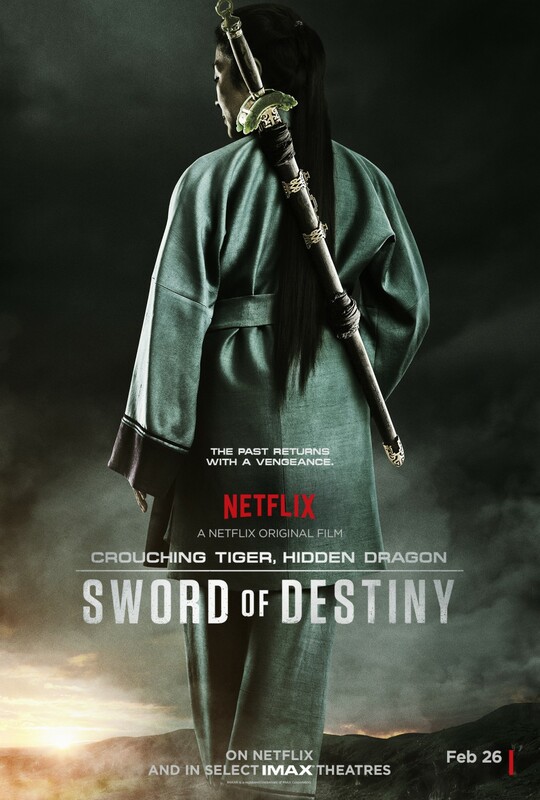 Sword of Destiny makes this apparent very early on when you realize that most of the original plot gets rehashed without adding the finesse of how Ang Lee told the story. At least he understood that he needed to make the audience more invested in the characters by emphasizing the predicaments his characters were in. In this film you only do that because most of the actors do their best with the little given to make their characters interesting. Which is admirable since all of them have been handicapped severely. For some unknown reason all of the dialogue is in English. Not dubbed mind you. And it almost made me wish it had because the bad dubbing of old kung fu flicks was one of the elements that made those films fun. (Just for the record. I want to see the films in their original language and have no problems whatsoever with subtitles.) It is something that took me a while to get past. Especially since the dialogue is awful. I am familiar with most themes explored here so I understood what they were trying to say but even then I struggled with how the characters talked. Their English is fine that is not the problem. But it is if their lines have been directly translated from Chinese to English with google translate. The consequence is that it makes it harder to connect to the characters. Fortunately though Yuen Woo-Ping makes the action scenes count as most of them are choreographed adequately. But do note that none of them are of the level you can expect from the master. 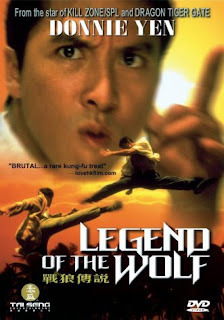 Since this is more a straight up kung fu flick than the original it is puzzling why Yuen Woo-Ping did not resort to his usual practice by giving us more exciting martial arts sequences. 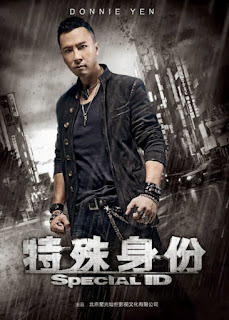 But having Donnie Yen and Michelle Yeoh doing the majority of the action helps to keep watching. It does make me wonder though how much Yuen Woo-Ping was in control of this film. I get a real heavy vibe that this film is more a Hollywood production than an Asian one and that Yuen Woo-Ping wasn't given freedom to do what he wanted. By now you are probably wanting to know whether you should watch this or not. While this film is heavily flawed and lacking in so many ways it still is not that bad. Not a film I would recommend but I do think this is one of those flicks to be enjoyed on those quiet Sundays or very late at night. Exactly the type of film you would expect to be streamed on Netflix.